Any excuse to drink Champagne is a good excuse in my opinion. 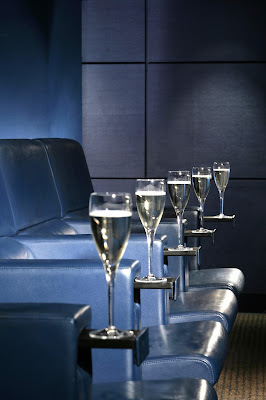 Which is why I'm so gosh-darn excited at the prospect of going to one of the Film and Fizz nights at One Aldwych Hotel in London. They start next Friday 13th September and run right through until the end of November, and are a great opportunity to catch some of the year's biggest films. I don't fancy the first film (Star Trek: Into Darkness) much myself, but I'm trying to decide between going to see Lincoln (Friday 18th and Saturday 19th October) or The Great Gatsby (Friday 22nd and Saturday 23rd November). Other choices include Mud, Behind The Candelabra (also a consideration of mine!) and Iron Man 3. It's not just a film, it's a lovely, decadent experience: you sit in the hotel's gorgeous Private Screening room sipping Champagne and snuggling up in the leather seating, escaping to a world of action, glamour and/or adventure. Then you have a delicious 3-course dinner in the Axis restaurant, featuring dishes like Yorkshire game terrine, venison in a red wine jus, and dark chocolate tart with poached cherries. How much will it set you back? £47.50 per person. Not bad for dinner, booze and a film - and you can make a night of it for £430 (based on two people sharing) by staying over and having breakfast and use of the hotel's spa and lounge the next morning. That's a bit out of my price range, but the Mr. Moneybagses among you might be tempted. They're also doing a wonderful Festive Film season in December, with the same package but showing films like It's A Wonderful Life, White Christmas and Miracle on 34th Street. HOW PERFECT! Have a look at the Film and Fizz section of the website for more details. What's your perfect booze and film combination?